A desiccant air dryer purifies compressed air by absorbing moisture and provides air purification from -40°F PDP down to -100°F PDP. A desiccant air dryer is used for compressed filtration in many industrial air compressor applications. 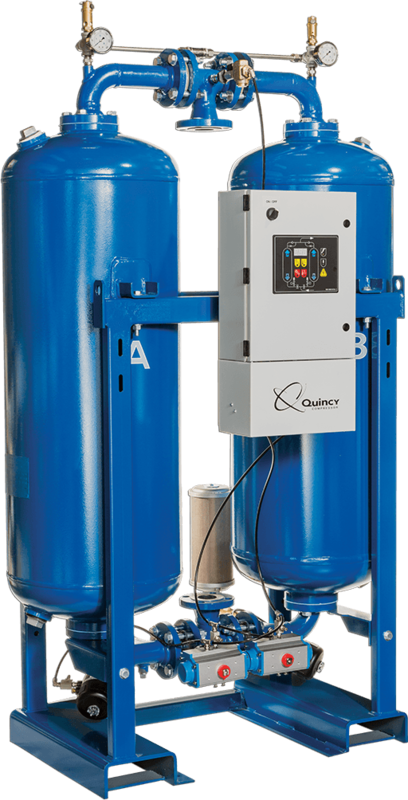 The QHD series desiccant dryer includes 13 models that deliver between 230 and 3,400 CFM of clean, dry air at a pressure of 100 psig. All feature a heavy-duty steel base and dual tower configuration that regenerates automatically. Like all our desiccant air dryers, the QHD heatless air dryer system includes high-quality components and is backed by a two-year comprehensive warranty. 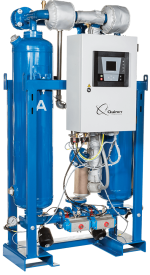 The QHP series heated desiccant air dryer features a built-in heating system that regenerates the offline tower using half the amount of air as our heatless dryers. This translates to improved efficiency, less wear and lower operating costs overall. Nine configurations are available that can deliver between 850 and 3,400 CFM of dry air at 100 psig. High-performance switching valve system found in the QHD and a heavy-duty steel base. Air is forced through the system at a maximum of 50 feet/second, with up to 5.5 seconds of desiccant contact time during the drying phase. Four hour drying phase, the heating phase two and a half hours, the cooling phase one hour and twenty minutes and the re-pressurizing phase 10 minutes. 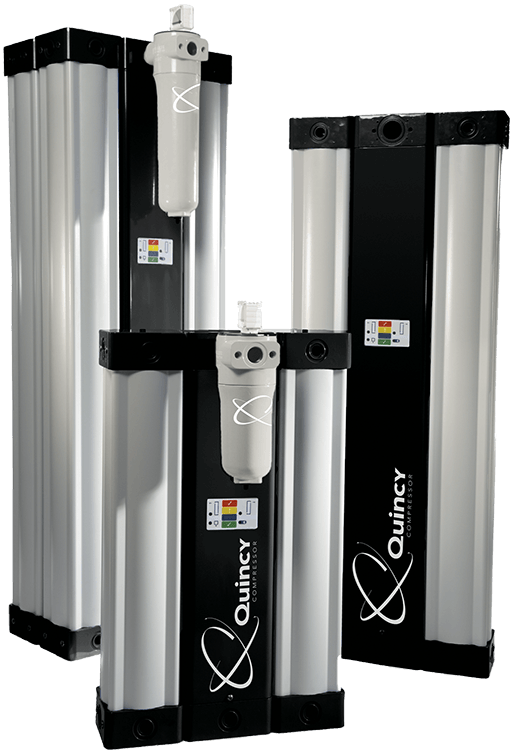 Quincy QBP dryers combine heat with forced ambient air for regeneration. As a result, they have a lower purge requirement than both the QHD and QHP desiccant dryer systems. Produces between 210 and 3,400 CFM of dry air at 100 psig. Lower ownership and maintenance costs deliver a strong ROI over the life of the product. Electronic controls and regulators automate the cycle, making it worry- and maintenance-free. Average purge levels are kept to 1.75%. For optimal performance, run the QBP blower purge desiccant dryer with a Quincy reciprocating or rotary screw compressor and Q-Sorb desiccant. Under normal conditions, Q-Sorb drying beads can provide up to three years of continuous operation. The Quincy QMOD is one of our most advanced systems. Use the QMOD dryer to remove moisture, aerosols and mist from a stream of compressed air. 15 available models accept input from NPT pipe sizes between ⅜” and 1½”, at flow rates from eight to 365 SCFM. Install the QMOD air desiccant dryer horizontally or vertically for maximum flexibility. Questions? 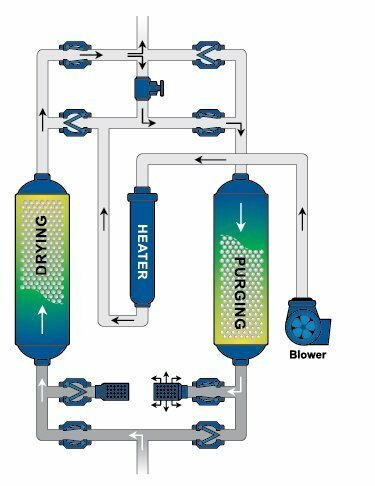 Contact us for more information and advice on selecting and maintaining your Desiccant Dryers compressed air filtration system.